Talk about strange. 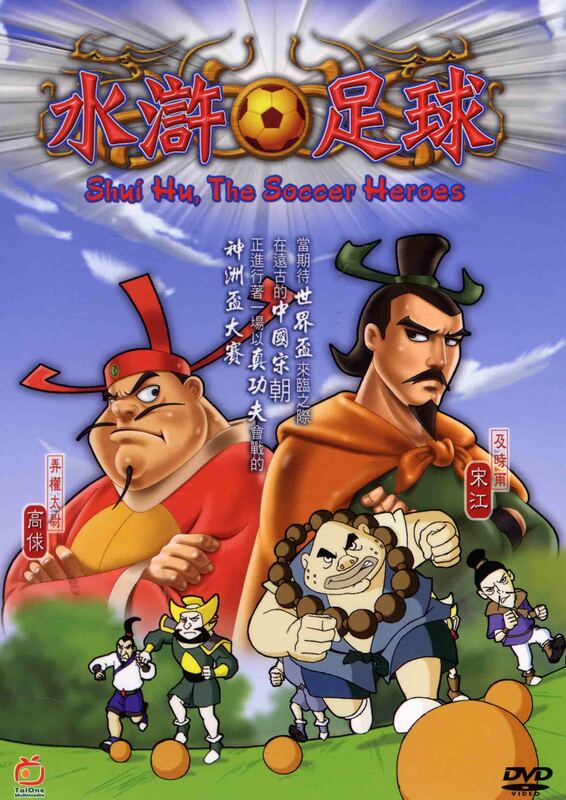 I found Shui Hu, The Soccer Heroes ( 水浒足球 ), an anime Chinese DVD, in my county library system. The animation is quite crude and similar to Captain Tsubasa, so that I thought this film must be from the early 1980s. Instead, this feature length cartoon from Hong Kong was produced in 2006. To start the absurdity, this soccer story takes place during the Sung Dynasty (around 960 to 1279). The Emperor loves soccer, and whoever wins the National Championship gets to become the Royal Team for 4 years. Accordingly, the games are held in a modern soccer stadium, and the players wear various kinds of ancient or mythical uniforms. The animators rip off many of the football moves from Shaolin Soccer, with players having stone-breaking, wall-crumbling, water-defying, tornado-generating, goal post-crunching kicks and yin yang goalkeeper saves. The evil Minister Gao Kau saves the Emperor’s kingdom by winning a challenge from a Korean dignitary. The Koreans have brought an iron soccerball instead of their country’s tribute. If none of the Emperor’s men can kick this heavy ball like the Korean player can, China must pay tribute to Korea instead. However, Gao Kau defeats them and wins the Emperor’s favor. As a reward, he is given the wealth and position of running the Royal Team. Later, the Liang Shen rebels make an attempt on the Emperor’s life. Gao Kau suggests that the National Championship be used as a lure for the rebels. Encourage the Liang Shen to form a team, and Gao Kau can capture and execute all the rebels on the soccer pitch. Meanwhile, Brother Sung Kong runs team Shui Hu. Provoked by Gao Kau over a loss, he bets his leg against Gao’s leg that Shui Hu will defeat the Royal Team in the Finals. I don’t understand why this is the second Hong Kong football film I’ve seen where men bet their legs over a match (see Boh Ngau). Maybe such stakes are supposed to reflect what big gamblers Chinese are, but it is repulsive nonetheless. Anyhow, now Sung really needs to win, and he knows his present team has little quality. So he tries to recruit his old teammates to play. These are the ones with the mystical Shaolin Soccer-like powers. However, they are not Robin Hood-style bandits anymore. They all run successful businesses. But mysteriously, a bunch of ninjas burn the businesses to the ground. So they return to the soccer pitch. That’s pretty much all you need to know. The rest of the movie proceeds the way you would expect, including the losing leg. There are a few major inconsistencies in the story, such as who the ninjas are and why they are attacking people. The emphasis on the Liang Shen rebels sort of evaporated too. Since the animation is so poor, you can’t enjoy the soccer. It looks like there might be a sequel, but this is such an inexplicably bizarre film, why bother even seeking out Volume 2? It’s probably best to watch this film while you are stoned on some ancient Asian medicinal. I can’t think of any other reason to watch it, except to marvel at the oddities that companies produce in a World Cup year. Shui Hu, the name of the team, is lifted from a famous Chinese myth, but I don’t think there is any real similarity between this plot and that of the Water Margin tale. However, the film is AKA “Water Margin Football”. I would keep children away from this film.